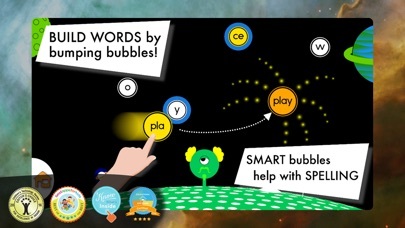 Bumping bubbles magically build words or invent your own to feed the silly creatures on Planet Lettra. 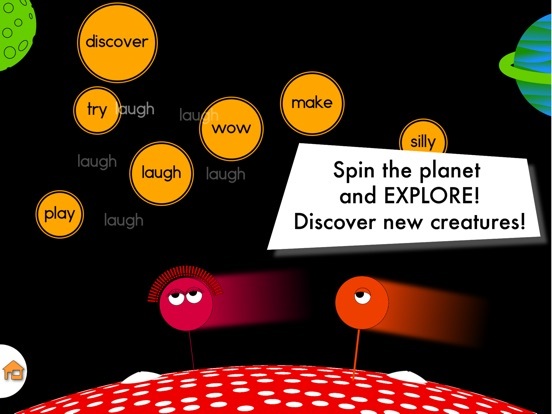 Kids love this app for experimenting with word building and hearing what they've made. Imagine a set of letter blocks that your child can arrange any way they want and hear what they've built, blocks that guide your child in building the most important sight words for reading fluency and give him or her lots of exposure to important letter blends, blocks that even form words all by themselves. That's Planet Lettra. You can even go below the planet surface, into the belly of Lettra, to see the real words you've already fed to the Munchers, hear them read aloud individually or one after the other. Or rearrange the word bubbles to make silly sentence. 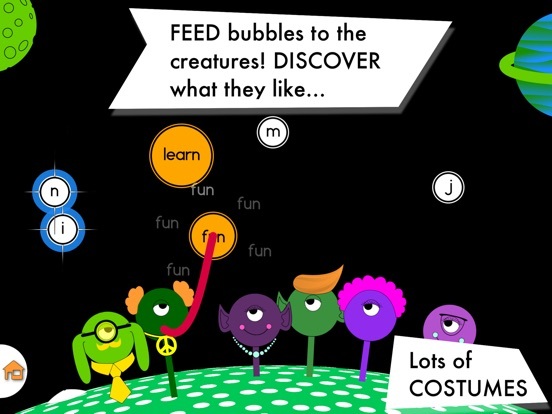 Whatever your child or student's age or reading ability, this app has plenty to discover and play with: green and purple Munchers that love to eat words, silly costumes, musical patterns, creatures with other special powers and more. In classrooms and special ed settings, educators use Planet Lettra to scaffold student learning in spelling and phonics. 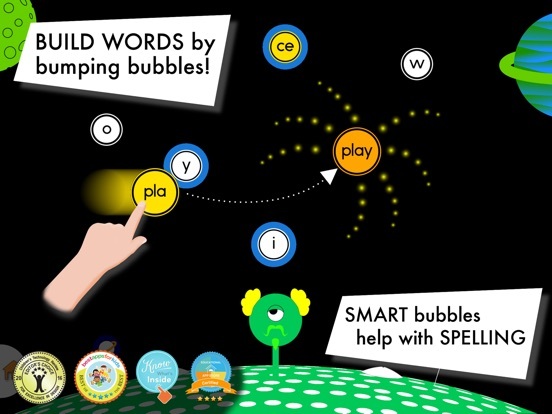 Special pink bubbles can be assigned values in the Settings area and used to work on building words with specific parts (practice specific blends or rhymes). 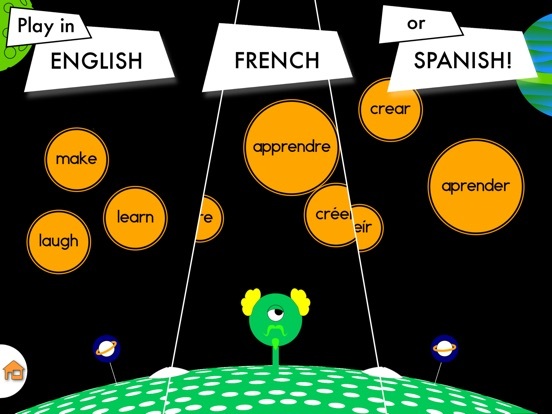 • Planet Lettra recognizes over 100,000 words in each supported language. 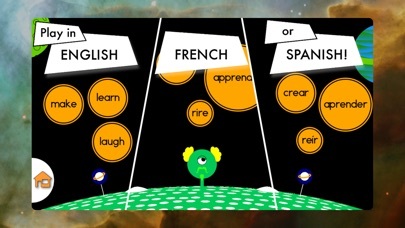 • Words important to reading fluency (about 1000) are formed more easily and more often. • The sound environment is musical, soothing and non-repetitive. 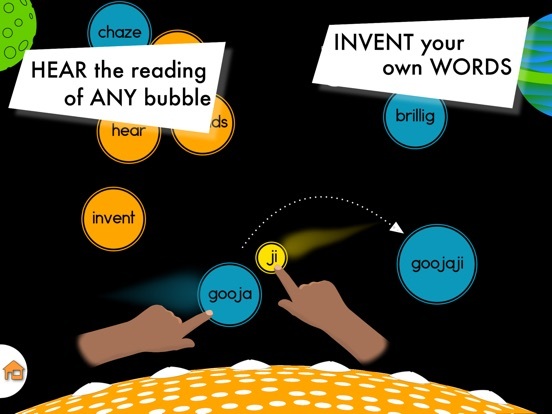 -- School Library Journal (slj.com): "Children will be delighted to discover that double tapping on a bubble triggers the narrator to pronounce it, even if it is an invented word. 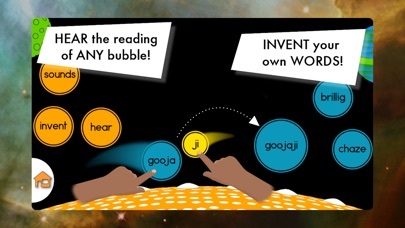 This app supports word recognition as “smart” letter bubbles (when users hold down a bubble) hint at combinations that lead to real terms. The real joy here is in playfully discovering what letters can do. -- Commonsensemedia.org: "The open-ended platform allows kids full freedom to explore and empowers them to find words all on their own." 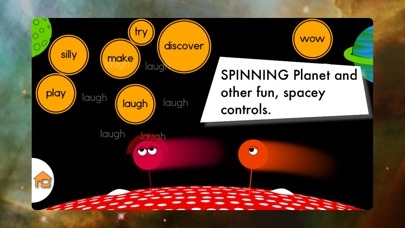 -- Educational App Store Certified, 4 stars, "This app is great for experimenting with word building and hearing what you have made. The app supports fantastic graphics and a unique playing experience." A refreshing little update: build "SUMMER" with your young one for a surprise. Remember that tilting the ring all the way down on tiny Planet Permea (upper right corner) will keep the bubbles from blending unless you are touching BOTH bubbles and push them together. Lots of tips in the tour video: tap the button beside "Watch ME!" on the home screen. Otherwise, just minor bug fixes. Thanks for travelling to Planet Lettra and have fun bumping bubbles and feeding the munchers.